Hawick, Scotland, January 29, 2018 – The European distribution rights of FiSpy – an innovative new product which uses smart technology to detect micro duct faults – have been awarded to Emtelle, a leading provider of blown fibre and ducted network solutions for the telecoms industry. FiSpy, developed by New Zealand-based FiComms, uses a patented process to identify a micro duct or micro ducts within a multi duct environment. This removes the risk of incorrect identification and cutting of ducts, reducing the time and cost currently spent on fault finding. 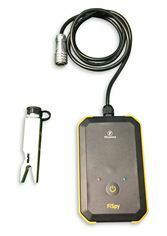 Other benefits of the FiSpy include low cost of ownership and maintenance, high user-friendliness and easy transportation, with the product featuring a compact design, interchangeable head sizes (5mm, 7mm and 8mm), an IP67 ruggedised case, simple LED indication and one-button operation. These capabilities will be showcased for the first time at FTTH Conference 2018, where Emtelle will put FiSpy to the test in a blown fibre race at its stand G01. The winner of the race will be presented with a FiSpy on the final day of the event. Sean Rainthorpe, CEO of FiComms, which developed FiSpy, will attend the FTTH Conference in Valencia and be available to discuss the product in more detail. “FiComms values Emtelle’s support during the development of FiSpy and we look forward to working together on this exciting opportunity,” added Sean. The FiSpy will join Emtelle’s full portfolio of products on display at FTTH Conference, including the popular retractable fibre cable RTRYVA, and the pre-connectorised fibre-in-tube solution QWKconnect – both simplifying the ease of installation, and reducing installation and maintenance costs. Emtelle’s International Business Development Manager, Scott Modha will also discuss how to improve the speed and efficiency of MDU installations for FTTH, even where fibre resources are limited, in the FTTH Conference Workshops on Tuesday, February 13 from 2pm to 5pm. FTTH Conference takes place at the Feria Valencia, in Valencia, Spain, from Tuesday, February 13 to Thursday, February 15. Emtelle, with its Headquarters in Hawick, Scotland, is a global leader in the manufacturing of blown fibre and ducted solutions since its inception in 1980. Over the 35 years it has been operating, Emtelle has assisted all the key players with FTTH roll-outs worldwide. Its emphasis is on listening to customer requirements, and designing innovative and unique products to meet the needs of customer projects. At the same time, it focuses on creating best value, reducing total project costs and minimizing installation time and disruption. Emtelle’s recent investment of more than €30 million in its European factory plants underpins this commitment. Emtelle’s global market coverage, including operations in the UK, Scandinavia and now Germany as well as sales offices in The Netherlands, Eastern Europe, Australia and Malaysia, allows it to serve more than 50 markets worldwide. Emtelle also has dedicated staff across the globe to provide field support to any customers regardless of location. New Zealand based FiComms Limited is a company dedicated to assisting with the successful global roll-out of Fibreoptic Communications. FiComms provide state of the art tools and equipment designed to facilitate this process in the most effective way. The company origins are in the FTTX industry giving FiComms insight into what works and doesn’t work when building and operating a network. FiComms vision and business are based on innovation, quality and efficiency and the company believe this is the best way to deliver the maximum benefits to their customers.